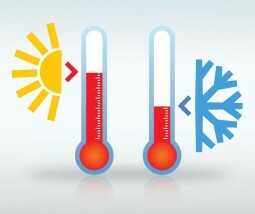 Whether the work was easy since only required to write down the formula to take the temperature. 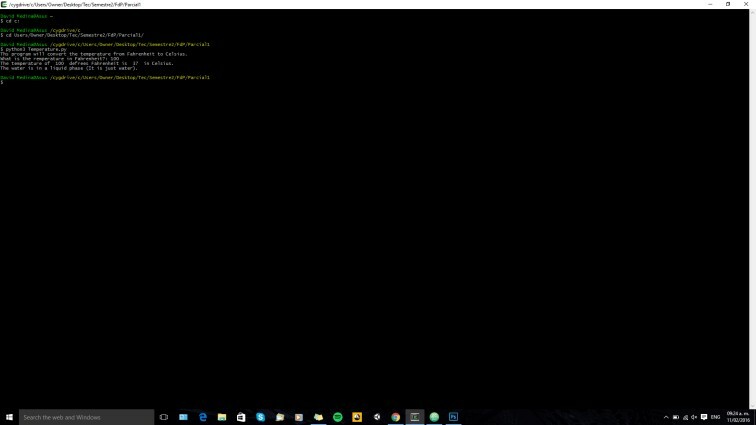 With this program I learned the basics of the conditionals in python. The if, elif and else are functions that evaluate certain conditions and if such condition is true, the program executes a certain code, that code would be the statement of the condition. There can be multiple if, elif and else in your code. Doing that is the first part of the code, and probably the easiest part. The next part requires the use of the if and else functions. Para poder hacer esta conversión, ocupamos de una formula, la cual es la siguiente: C = 5 ∗ (F − 32)/9. Se utilizó el tipo float por el hecho de que al momento de realizar casi cualquier conversión de F a C, dan como resultados números con sus decimales, y hace la conversión mucho mas exacta. Esta actividad no me resultó complicada, ya que anteriormente se ha trabajado con este tipo de operaciones, lo único diferente, nuevo y complicado fue el incluir el IF. In order to make this program work properly I use a str(input()) to make sure that the user only type in string and not any other character. Then the logic is simple, just by using some if and elif that validates the user choice, and an else at the end that display if the user enter an invalid character. 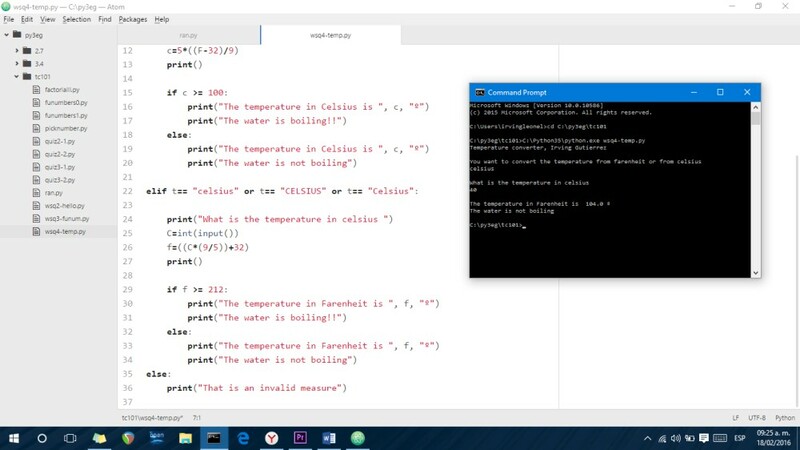 Then I use a int (input()) just to make sure that the user type in a number and if the temperature that the user type in is higher than the boilling point of water, it will display that information and the final temperature. I had trouble with this one at first, because I didn’t get the condition right. I had to research on the book, and then I realise that it wasn’t hard at all. All I need was to define the variables, the formula and write the condition right. 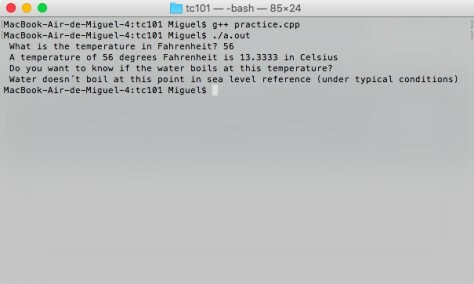 For this assignment we had to write a program that will prompt the user for a temperature in Fahrenheit and then convert it to Celsius. You may recall that the formula is C = 5 ∗ (F − 32)/9. Modify the program to state whether or not water would boil at the temperature given. I actually didn’t have any problems because as I said before I have programmed before in C++ so this one is a piece of cake. 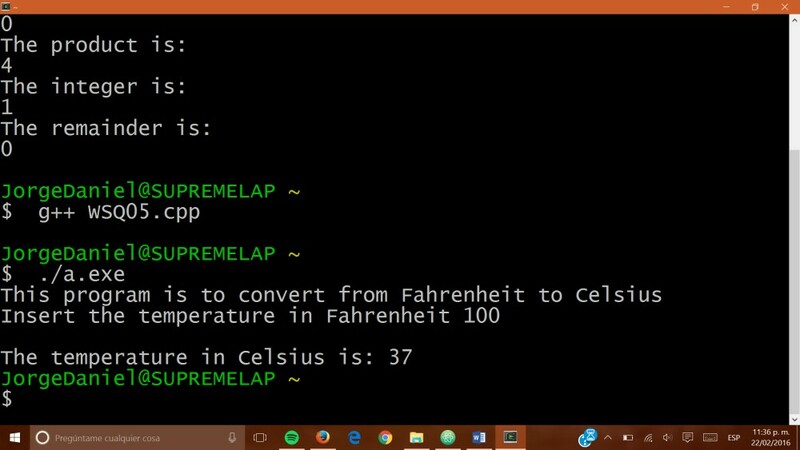 In this WSQ i did a program that will give you the temperature in Celsius from Fahrenheit. 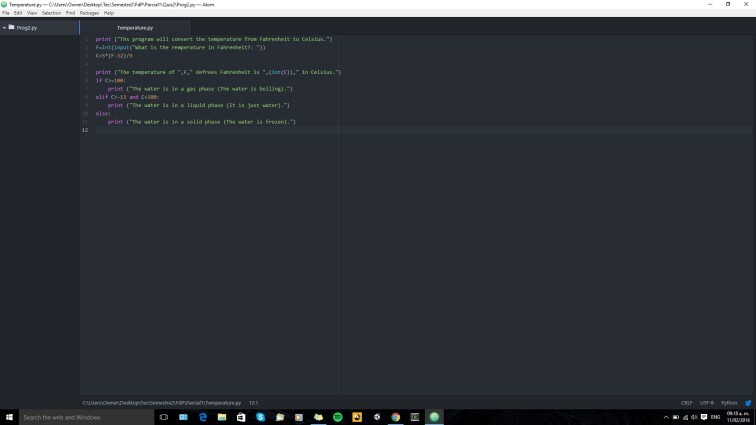 This is the code of the program in Atom. This is the code running in the console. If you don’t know how to use “if” and “else” here are some videos, it might be useful. We’re back on python and straight into our practices. You might wonder why I’m leaving WSQ04 undone, that’s because that practice isn’t really about coding but something more of an opinion essay. I really want to concentrate on the real work right now and then move on to that. I’ll edit this later on. This was a really easy to make program. 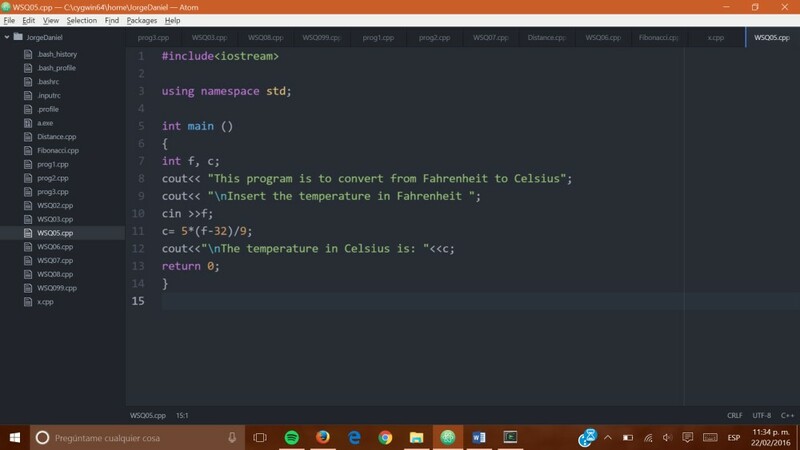 For this WSQ I had to make a program that would allow the user to change a temperature in Fahrenheit to Celsius. 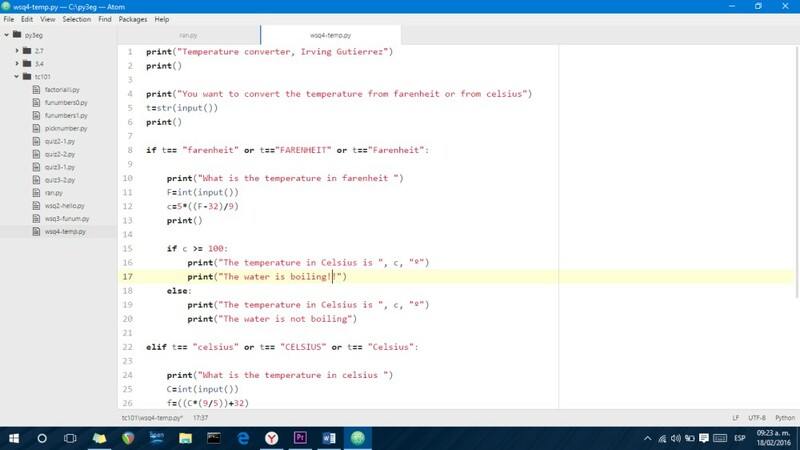 And after that the program would say if water would boil or not at the temperature given. For changing Fahrenheit to Celsius I just needed to write a program like the others but with the formula to change Fahrenheit to Celsious. For saying if the water would boil or not I decided to used an if/else. If the temperature in C° was more than 100(temperature in which waters boils) it would say that in normal conditions, water would boil but if the result was a number smaller that 100 then it would say that water would not boil. You can see my program right here: Temperature. And this is the prove that it is working 😛 . 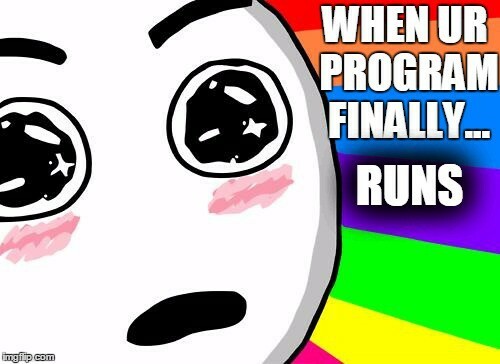 I made this meme after finishing the program JAJAJAJ.